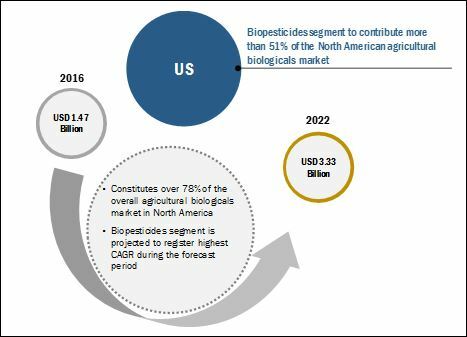 [178 Pages Report] The agricultural biologicals market was valued at USD 6.00 Billion in 2016, and is projected to reach 12.86 Billion by 2022, at a CAGR of 13.77% during the forecast period. The key players have been identified through secondary sources such as the US Department of Agriculture (USDA), the US Environmental Protection Agency (EPA), the Food and Agriculture Organization (FAO), the International Fertilizer Association (IFA), and the International Fertilizer Development Center (IFDC), while their market share in respective regions has been determined through both, primary and secondary research. 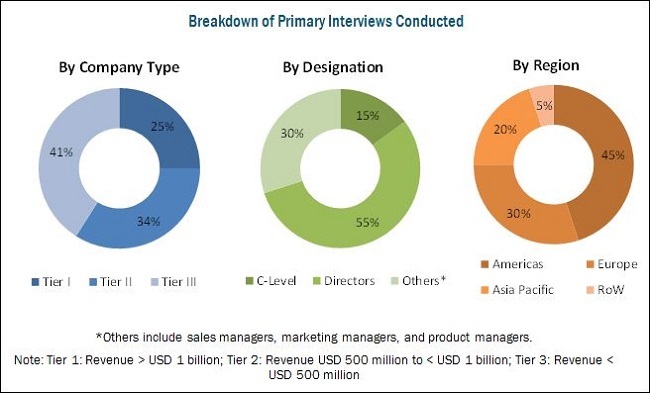 The research methodology includes the study of annual and financial reports of top market players, as well as interviews with industry experts (such as CEOs, VPs, directors, and marketing executives) for key insights (both quantitative and qualitative) for the market. The various contributors involved in the value chain of the agricultural biologicals market include raw material suppliers, R&D institutes, agricultural biologicals manufacturing companies as Bayer (Germany), Syngenta (Switzerland), BASF(Germany), Monsanto BioAG, (US), and DowDuPont, (US), and government bodies & regulatory associations such as the US Department of Agriculture (USDA) and the US Environmental Protection Agency (EPA). This research report categorizes the agricultural biologicals market based on type, source, mode of application, application, and region. Agricultural biologicals are products derived from natural sources such as microorganisms, plant extracts, or other biological matter, and can be used as a substitute for agricultural chemical products. They provide crop protection from pests, diseases, and other threats, such as weeds. They also help enhance the growth of the plants, and help in keeping them healthy. Farmers have started to use agricultural biologicals along with biotechnology and a variety of agronomic practices in order to grow healthy and nutritious crops. 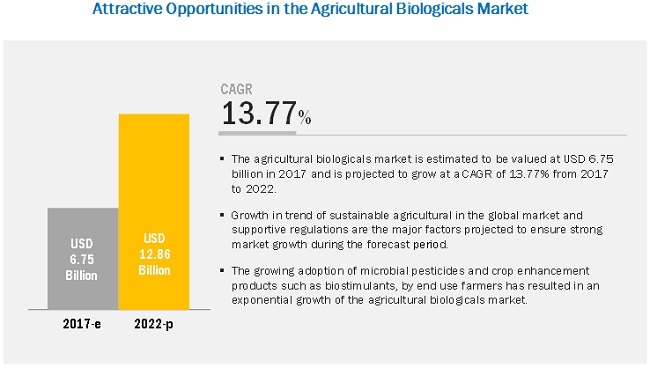 The global agricultural biologicals market is projected to reach USD 12.86 billion by 2022, at a CAGR of 13.77% from 2017 to 2022. The segmentation of this market is based on type, source, mode of application, application, and region. Growth in trend of sustainable agricultural in the global market, low residue load, and supportive regulations are the key drivers fueling the growth of the agricultural biologicals market. Limited product availability and low efficacy of biologicals act as the major restraining factor for this market. The market for biologicals is at the emerging stage in countries such as India, Argentina, Japan, and Africa, due to the low efficacy of biologicals compared to that of synthetic pesticides or fertilizers. Conventional insecticides have immediate knockdown effect due to high chemical residue, which helps to kill the insects at a faster rate. Additionally, the availability of such biological products still remains very limited in the market, due to different regulations being prevalent in different countries. Product and formulation registrations, in addition to the usage of new active ingredients, makes it difficult for companies to make their products available globally at the same time. This tends to further weaken the knowledge and awareness about the product, making the technology all the more difficult to gain pace. There remains an established market for chemical products, on which farmers heavily rely, making the market for biological products a niche and steadily growing one. The market, however, is faced with challenges, such as poor agricultural practices and supply chain infrastructure. 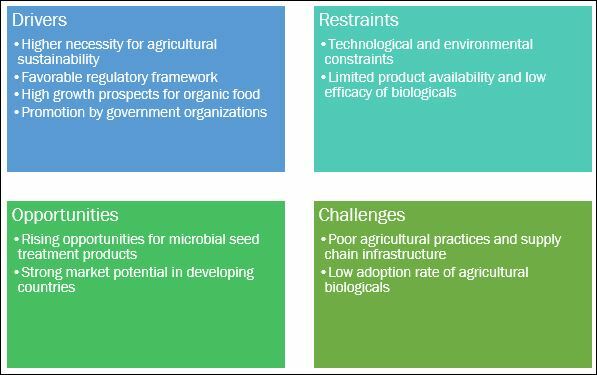 Lack of basic infrastructure is a major challenge in the development of the agricultural biologicals market in many countries, especially in the Sub-Saharan region. High transportation costs due to poor infrastructure, limited market information, lack of storage facilities, and limited business skills and knowledge are some of the major challenges faced by the agricultural sector in this region. According to the African Journal of Agricultural Research, the high cost of transportation is a result of the long average distance covered by agro-input dealers to source their goods. Poor domestic infrastructure and limited access to agricultural credit also undermine the effect and equitable participation of many African countries in world trade. 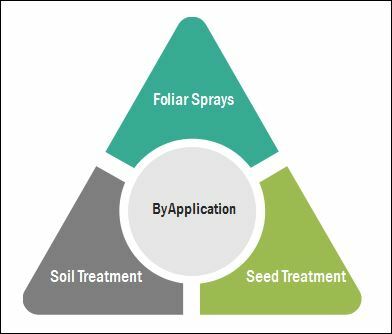 The foliar spray means of application of biologicals is one of the most widely used methods to maximize production capacity. Growing plants readily assimilate trace nutrients in a combination with biologicals. The direct application on leaves is the most effective way of supplying nutrients to plants, which results in enhanced productivity and greater yield; this also leads to rapid absorption and a uniform supply of nutrients to each part of a plant. Foliar spray fertilizers are a good means to supplement the nutritional needs of your plants. Therefore, there is a wide variety of foliar feeds to choose from; usually, water-soluble powder or liquid fertilizers are used. Foliar spray is an excellent solution for plants experiencing stress. Macronutrients and micronutrients are normally added along with biostimulants meant for foliar application. Trace minerals and other readily available nutrients are absorbed faster and easily by plants. Amino acid biostimulants applied as foliar sprays enhance the photosynthetic rate and dry matter partitioning, thereby increasing crop yield. Proteins and vitamin B are also added to control fungal diseases. Soil treatment can be defined as the steps taken to improve the quality of soil by means of adjusting the pH of the soil, improving nutrient quality, and protecting the soil from weeds, pests, and harmful organisms. It also encompasses soil remediation measures through physical, chemical, and biological methods, undertaken to remove hazardous substances from the soil that has been contaminated and made unfit for production of agricultural products for human consumption. Deficiency of organic materials, sand, and high clay contents make the soil poor and unsustainable for plant growth. Soil treatment using biologicals provide better rooting environment for plants by improving soil structure, aeration, water retention, and nutrient availability. Seed treatment is defined as the application of biological and chemical agents to control primary soil and seed-borne infestation of insects and diseases that lead to devastating effects on crop production; it improves crop safety and plant health, resulting in better yields. Seed treatment protects seeds from early season diseases and insect pests, which improves crop emergence and growth; it also improves plant population, resulting in higher productivity. The application of biologicals to seeds helps the crops grow uniformly by retaining optimum moisture content, stimulating seedling development, and activating soil microflora. It also results in increased stress tolerance. Poor agricultural practices and supply chain infrastructure in the agricultural biologicals industry has been hampering market growth. When will this situation ease out? Is the low adoption rate of agricultural biologicals restraining the growth of the market? Most of the suppliers have opted for agreements, partnerships, and collaborations as their key strategies for market share growth. Will this trend continue to have the same impact during the forecast period? How big are the threats of technological and environmental constraints to the agricultural biologicals market? Will a favorable regulatory framework aid market growth over the next five years? The agricultural biologicals market is estimated to account for USD 6.75 billion in 2017 and is projected to reach USD 12.86 billion by 2022, at a CAGR of 13.77% during the forecast period. Strong funding by the private and public sectors towards promotion of biologicals over chemical counterparts and rising application of microbial products field and vegetable crops are projected to drive the growth of the market over the next five years. On the basis of application, the cereals & grains segment is projected to witness the fastest growth during the forecast period. Corn, wheat, and rice are the major cereals treated with biological products for crop protection. These crops require high amounts of nutrition and water, and biofertilizers help to fulfill these requirements by maintaining soil fertility and providing nutrients. The economic importance of corn due to its application in various sectors and increasing demand for high-quality wheat and rice in the food industry are other reasons for the adoption of advanced crop protection technologies among end users. The product portfolio of major companies involved in the agricultural biologicals market is more focused on biopesticides due to the higher demand for bioinsecticides and biofungicides for integrated pest management in developed countries. The increasing regulations posed by national governments to maintaining the MRLs for synthetic pesticides, and also the ban on certain pesticide classes in Europe are the major driving factors towards adoption of biopesticides in developing and developed countries. The growing market for agricultural genetics in various countries of the Americas and the declining cost of Advances in the field of genetic technology have brought about the third revolution in crop improvement and these tools can be used along with existing technologies. Growing innovation would facilitate the growth of agricultural biologicals market, especially in countries such as the China, Brazil, and South Africa. Many of these microbials have various properties/characteristics that help in the control of fungi, bacteria, insects, and weeds. They also stimulate plant growth and yield by improving access to nutrients. The high cost of developing new chemical pesticides, increase in resistance among insects and weeds to chemical treatments, and high regulatory pressure to limit chemical usage with respect to ecosystem damage have contributed to an increase in the need for beneficial microbes. Also, microorganisms from different soil ecosystems are collected, selected, and tested for crop health and productivity by the key players such as Monsanto and BASF, and hence microbials segment occupied the highest share in agricultural biologicals market. 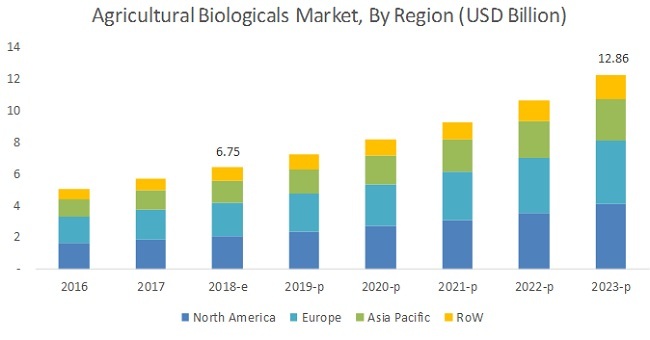 Asia Pacific is projected to witness the highest growth in the agricultural biologicals market during the forecast period. There has been an ever-increasing demand for crop protection and crop nutrition products in the Asian market, in line with the growing economic growth conditions. Also, seed manufacturers such as Bayer, Monsanto, and Syngenta have been showing increasing interest in tapping this potential market, wherein the companies have been expanding their R&D centers across the Asia Pacific. Regulations on chemical usage has been restricted in agriculture industry across major countries and governments have been promoting sustainable practices in these countries. Moreover, the growth of the biotechnology industry observed in China, Japan, and India translates to the high-growth potential of the market during the forecast period. Crop protection has been practiced for hundreds of years, with an aim to reduce the post- and pre-harvest losses. However, advanced technologies and biotechnological innovations have been revolutionizing this practice. Hence, agricultural companies are continuously investing in identification of beneficial microbes and developing products at a faster scale as compared to synthetic pesticides. Companies such as BASF, Bayer, Syngenta, Monsanto, and DowDuPont have been focusing on technological innovation in patent registrations for new product launches to strengthen their market base in the agricultural biologicals market. Apart from these companies, other agricultural biological companies include Valent BioSciences, Koppert, Arysta LifeScience, Isagro, Valagro, Marrone Bio Innovation, and Biolchim, which have been strengthening their market position through product launches and distribution & technology agreements. In December 2017, Marrone Bio Innovations announced the launch of its new high-performance and cost-effective biofungicide, Amplitude, which can be applied to large acre crops. This will help the company to cater to the demands of a new customer base. In November 2017, Koppert expanded its activities in the African market by setting up a subsidiary in Ivory Coast for biological solutions and biostimulants. In order to explore the market, it planned to work with local distributors and enter into partnerships with local institutes and universities in the West African region. In June 2017, Arysta LifeScience acquired Verios Agro Pty Ltd and Veriprod Pty Ltd (collectively, "Verios"). This acquisition helped the company increase its presence in the African market. Which region will have the highest share in the agricultural biologicals market? Which source of agricultural biologicals have high demand in each key country market? What are the trends and factors responsible for influencing the adoption rate of biotechnological methods in key emerging countries? What is the level of investment preferred by end use farmers to adopt these technologies?